Although some patients are able to eat or drink almost anything while in braces and have no ill effects, there are certain dietary habits that are known to cause breakage of orthodontic appliances as well as increasing the risk of dental disease. Our aim is to achieve the treatment goals with as few disturbances due to appliance breakage as possible, and minimize the side effects of poor diet choices. Remember, teeth move their best in a healthy environment and in individuals with excellent overall health. Be sure you have a well balanced diet. Foods and drinks which your dentist has suggested may cause dental caries (cavities) should be restricted while wearing braces. Sticky foods are to be avoided because of the increased risk of dental decay and appliance breakage. These foods stick to braces and remain on your teeth for long periods of time. If foods or drinks high in sugar content are to be consumed, we advise having them with regular meals or at one given time of day. Please make sure that careful brushing and rinsing take place immediately afterwards. Between meal snacks should be confined to foods without refined sugar and should be followed by toothbrushing or vigorous rinsing if a toothbrush is not available. 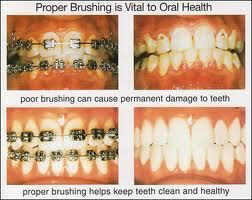 Braces are attached to your teeth with an adhesive which normally will withstand the forces of eating. However, braces can be dislodged and wires bent or broken while eating certain foods. Hard foods, such as nuts, hard candy, corn chips and even crisp taco shells can harm your braces and should be avoided. Chewing ice cubes, pencils and fingernails can also be very destructive to your appliances. Some foods such as whole apples, raw carrots or celery are healthy snacks, but must be cut to avoid damaging your braces. Chewy foods such as caramels and even thick bread crusts can bend and distort wires causing treatment delays and extra visits for repairs. Popcorn can cause harm in multiple ways. The husks from the popcorn can become lodged beneath the braces and cause irritation to the gum tissue. Unpopped kernels can shear or break off brackets as well as bend or dislodge wires. Remember if you have any questions about dietary restrictions or good food choices, PLEASE ASK! The adhesive used for attaching the braces to your teeth cures rapidly initially. You can eat anytime after leaving our office, however, we ask that you be mindful of the suggested eating list for foods that may be harmful to braces. Until you become accustomed to eating with your new braces, you may find it beneficial to follow a diet consisting of soft foods for a few days. Initially the braces feel like they “stick out.” This is normal. 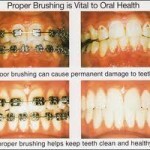 As you become accustomed to your braces and tooth alignment improves, this sensation will cease to be a concern. Although the brackets are round and smooth, until the cheek tissues have “toughened,” you may find it helpful to use a small piece of wax around the bracket that is creating the irritation. If your supply of wax runs out, call our office for more. We also recommend rinsing with warm salt water three times a day and to utilize the Orabase gel to soothe cheek irritations. You will probably notice some discomfort beginning a few hours after your braces are placed. Some teeth, usually the front teeth, may be “tender” and sensitive to pressure. Occasionally, patients report that they experience no discomfort, but most have some soreness beginning during the first eight hours and dissipating within the week. Exactly when the discomfort ceases is impossible to predict and differs with each patient. Nonprescription pain remedies are recommended for discomfort. For maximum effectiveness, it may be best to take such medications before the discomfort begins. Using your finger and tongue, check that wire ends do not extend into areas which might poke or abrade the tongue or cheek. Make sure you understand what you are to do until your next appointment. This could include wearing elastics as instructed, activating an expander or following specific hygiene or diet instructions. Make sure you have an adequate supply of orthodontic wax, special cleaning aids, elastic bands or other related materials you may need between appointments. Always schedule your next appointment before leaving the office. Waiting 1-2 weeks after an appointment to schedule your next office visit complicates the scheduling process, since appointments are programmed 4-6 weeks in advance. Postponing appointments is a common contributor to extending treatment. This entry was posted in Braces, Orthodontic and tagged appliance breakage, braces, cheek, Dental caries, elastic bands, orthodontic appliances, orthodontic wax, teeth, tongue, well balanced diet on May 10, 2012 by chzechze.